No one does Baked Potato Soup like Houlian's. They use instant mashed potato flakes for a special flare. Prick washed potatoes & bake until a fork pierces to the center easily. Remove potatoes from oven & allow to fully cool. Remove skin & cut potatoes into 1/2" cubes. Set aside. Melt butter in a large saucepan. Add onions & sauté over low heat for 10 minutes or until onions are translucent. Don't allow onions to burn. Add flour to onions & butter and cook 4 - 5 minutes, stirring well until flour is absorbed. In a separate container, combine water, chicken base, potato flakes & seasonings. Stir or whisk thoroughly to eliminate lumps. Add slowly to onion mixture, stirring constantly so no lumps form. Increase to medium heat & continue cooking until the soup begins to gently simmer. Add milk & cream, stirring until smooth & lightly thickened. Simmer for 15 minutes. Do not boil. Soup should just simmer lightly. Add cubed baked potatoes & Stir to combine. This is terrific. Great post. 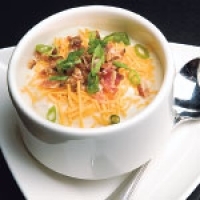 Love potato soup and it is a great dish to warm up on a cold afternoon, or evening. Like lucasanderson's recipes? Never miss an upload!